Ginger could help asthma treatment become more effective as it has been found to interact with drugs that relax the airwaves, according to US scientists. Asthma attacks occur when the bronchial tubes that carry air into and out of the lungs tighten up and constrict, but in laboratory tests it was discovered that when components of the peppery root were added to medicines called beta-agonists, they increased the relaxation of airway smooth muscle (ASM) tissue samples. The findings should give hope to people with the condition, but when it comes to travelling overseas sufferers should remember to arrange asthma travel insurance for added peace of mind. Scientists from Columbia University took samples of human ASM tissue and deliberately caused them to contract by exposing them to the chemical acetylcholine. They then treated the samples with the beta-agonist isoproterenol mixed with three separate components of ginger - 6-gingerol, 8-gingerol and 6-shogaol. Of the three, 6-shogaol seemed the most effective in increasing the relaxing effect of the beta-agonist. 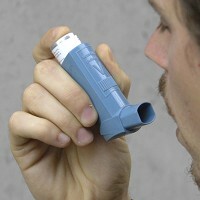 Further tests showed all three ginger compounds suppressed an enzyme linked to asthma symptoms. The research was presented at the American Thoracic Society 2013 conference in Philadelphia.